Grant Leadbitter has returned to Sunderland - and Black Cats fans have one of their own to cheer again. The 33-year-old, born in Chester-le-Street, left his boyhood club almost a decade ago after graduating into the first-team from the Academy of Light. He moved to Ipswich Town to team up with Roy Keane in 2009 before spending the last seven years at Middlesbrough. 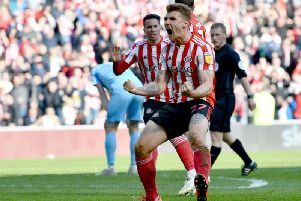 Now, Leadbitter has completed an emotional return to Wearside - signing a two-and-a-year-deal - with many Sunderland fans thrilled he has "come home". And the Black Cats-faithful have already switched their attentions to more arrivals with just three days of the transfer window remaining. @calvinfox_22:"Can’t wait to see Leadbitter smashing a 40-yarder top bins back at the SOL". @liam_marsden89: "Cracking singing for League One Leadbitter IMO even if he is approaching twilight of his career. Could easily still play top half of championship, great tekkers and can dictate play, decent ping on him as well, and Sunderland through and through. Morgan + 2 strikers needed now!! @NathFryatt: "Leadbitter - hell of a signing, anyone that says otherwise is clueless. Welcome home". @JeebazSandals: "Leadbitter a great signing for us. Will dominate this league in the middle of the park and can pick a pass which is something we are desperate for......... oh and somebody to pass to would come in handy #safc"
@shalpaca1: "He’s come home! Grant Leadbitter, Welcome back! #safc"
@Carlzinho: "Leadbitter hasn't played a whole lot of football this season, might take a little while to get going." @PeterBeuster: "Fantastic to hear Grant Leadbitter's opening interview, so much desire to play for the club again, my initial reaction was 'similar to what he have' but i think he will have a great impact off the field as well as on it. Welcome home son." Ha'Way Back When: No doubt Sunderland have a gruelling Easter but we used to play three times! @_wisemensay: "Two and a half year Grant Leadbitter will be a Premier League player again, who knew". @DavidNunn73: "Quite happy with the Leadbitter signing. Eaves or Marquis would be good moves - both proved that they score goals this season. Hopefully feel-good factor is back come Saturday. #safc"
@braddfearnleyy: "Surely we have the money to get both Marquis and Eaves ? #safc"